Take up a membership with us and receive welcome gifts this March and April! Plus, existing members can redeem gifts too when they successfully refer a new member! Promotion is only redeemable from the my golf kaki office during the promotion period. For queries, email contact@mygolfkaki.com or call 6342 5188. 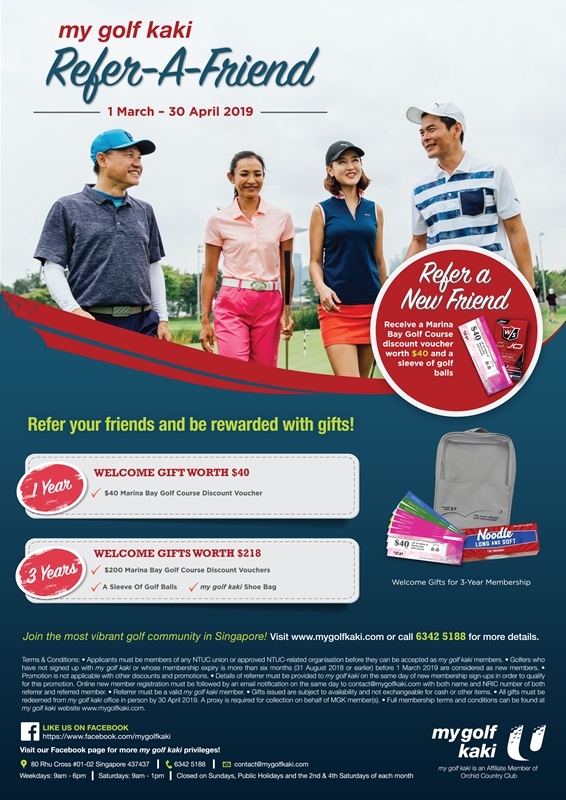 - Gifts are available for redemption at the my golf kaki office during the promotion period only (last redemption on 30 April 2019). - Gifts are issued on a first-come, first-served basis. Strictly no reservation is allowed. - All gifts are to be redeemed in person. A proxy is required for collection on behalf of MGK member(s). - Gifts will be deemed forfeited once the promotion ends. - 3-year membership promotion not applicable for Junior category. Sign up for our 3 year membership and redeem a voucher booklet worth over $200! Offer is only applicable for Ordinary, Senior and Associate membership categories. All vouchers are valid for 6 months from date of issue and is transferable among valid my golf kaki members. Voucher booklet is only available for redemption at the my golf kaki office during operating hours and while stocks last. Golf vouchers are not for use on public holidays. For a detailed description of the vouchers as well as the terms and conditions, please click here. For more information, email contact@mygolfkaki.com or call 6342 5188.